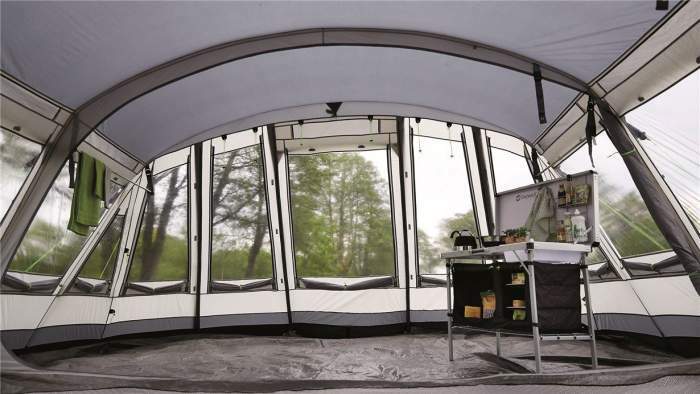 Outwell Vermont XLP Premium 7 Person Tent is one of the largest on the market with 371 ft² (34.48 m²) total area in its 5 rooms. It provides full protection with its impressive 6000 mm waterproof rating and steel poles. Outwell Vermont XLP Premium 7 Person Tent. When you have a tent of this size and with so many features it is a bit difficult to choose where to start. So perhaps to begin with rooms first. This tent has three sleeping rooms plus a huge living room, and a fully protected porch. This is why I have included it in my list of 5-room tents. It looks like a typical tunnel-shape design with no less than 5 long arches. But if you look closely, the 10 side poles are completely straight, so this is more a cabin tent than a tunnel tent, or you could call it a hybrid tunnel-cabin type if you wish. The tent is huge and heavy, and in view of its tunnel structure, it is not freestanding. 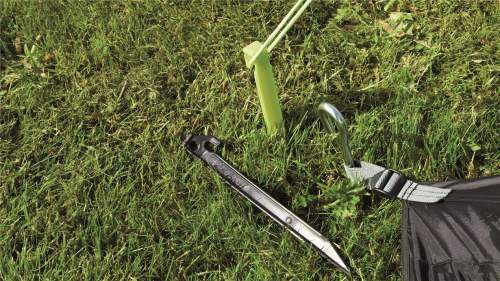 So stake it down properly, you have several types of color-coded stakes in the package, you will see them in the video below. It needs a lot of areas, the external dimensions are enormous, you have 319 x 189 inches (810 x 480 cm). But you also have numerous guylines around so the actual area needed for this tent is much larger. This may be a problem in some camps where the area per tent is limited. View from the living room through the porch area. Observe the shutters under the PVC windows. Note that this tent has been on the EU market for at least 6 years already but it is new on the Amazon-US. So there are several variants with some small differences, do not get confused when you see them on the Internet. Size-wise, the tent is enormous, just see the floor plan below, but its declared capacity is 7 people. They do not give exact numbers for the floor area, so here is my own breakdown. There are differences between the inner and outer dimensions because of the inner tent which you have in the sleeping zone. So this area has 11 square meters. The living room is with the area of 12.48 square meters and this means that the total inner area is 23.48 m² (253 ft²). Now, you have also the huge porch with a but complicated shape but its size is approximately 11 m² (118 ft²) and it is also with a floor. All in all, you have 371 ft² (34.48 m²) and this means 53 ft² (4.9 m²) per person. This sounds incredible. Note that the living room is also fully sealed and here you can have the same number of people sleeping if necessary. So the tent can easily accommodate 14 people and you will still have the huge floored and protected porch for all your gear. Seasons-wise, this is a 3-season plus tent. It comes with one of the highest waterproof ratings and the poles are steel, so it offers a full protection. According to the statements from the manufacturer, it has been tested to force 10 on Beaufort scale. If you are not familiar, this corresponds to winds of 89 – 102 km/h (55 – 63 mph). Now, compare this with its smaller cousin the Outwell Nevada 5 tent with the number 8 on the same scale. Climate-wise, you will see more below about ventilation, here just to stress that I see it better suited to a cooler climate with lots of rain. This is a fully sealed structure which depends on vents and it keeps the inner warmth well. But it has many doors (7 in total) and all of them are with mesh so it can be used even in a warmer climate. Being so enclosed and sealed, this tent will also perform excellently in the conditions with lots of sand and dust in the air. Weight-wise, well, be ready for this. This is a very heavy item. The poles and the tent are separate and the total weight is 125.5 lb (56.8 kg). Also, the packed size is huge, you have two packages 30.7 x 15.7 x 16.5 inches (78 x 40 x 42 cm) for the tent and 30 x 9 inches (76 x 23 cm) for the poles. So this tent needs lots of space in the trunk and it needs two people to deal with it to set it up. Note that the inner tents are removable so you can use this huge protected space for family events in the garden. This inner area has i) the living room, and ii) two inner tents in it and this is the sleeping zone. But you will realize that there is no much difference between the inner and porch area. The sleeping zone is a sort of dark rest area. The inner tents are attached to the shell tent. The sleeping zone is with 3 sleeping rooms and here you have two inner tents within the external shell, so this part is a double-layer design. 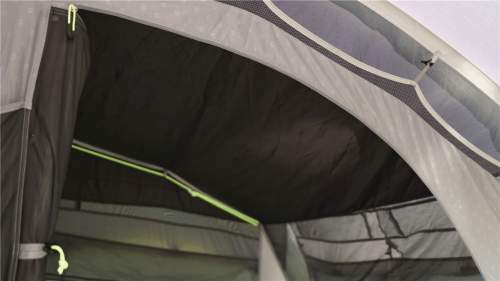 When you take the tent down, the inner tents remain in place (attached to the shell, see the picture above) and this makes next pitching easy. One of the inner tents is with two sleeping units for 2 and 3 people, and the second inner tent is separate and it has a place for 2 people. Note that they have made the roof of the inner tents from a dark material so you have a considerably reduced glare and can sleep longer in the morning. This is normally described as the dark rest design or lights out design. Observe that the sleeping rooms are much longer than in other tents of this type. Here you have 250 cm length, and compare this to Vango tents (e.g., Vango Iris 600 XL, Vango Marna 600 XL), Eurohike tents (e.g., Eurohike Buckingham Elite 8, Eurohike Hampton 6), and Coleman tents (e.g., Coleman Air Valdes 6 XL) where this is always around 210 – 215 cm. The living room has 2 external doors on the sides and one huge door that leads to the porch, plus three other inner doors to the sleeping rooms. Now, the front wall between the living room and the porch is all zipped (imagine this is 4 meters wide wall) so you can open it completely, but you can also use it as a huge door. There is a mesh in its upper part for ventilation. You also have two huge PVC windows on the sides. The porch is an incredibly useful and functional space with 9 PVC windows and the removable floor. From outside you have a mad skirt and from inside the floor has a bathtub profile and you fix it with toggles to the walls and you have full protection here as well. So if you feel lost already, the main difference between the “inner area” and the porch is that the former has a fully sewn-in and sealed floor, while the porch area has a linked-in floor which attaches to the walls. Both sections, the inner and the porch, have a bathtub shape floor. You have yet another nice feature here – the front part of this floor in the porch zips out and you can make it flat so that kids do not catch it when they run around, or that you can use the entrance to get in with a wheelchair. They were really thinking of everything here. But the “inner tents” have also their own bathtub floors as I mentioned above, which means that in the sleeping zone you have a two-layer floor. I stop now about the floors, I guess you have had it too much. But it was necessary to address this issue to realize the differences between the two main areas. They both are fully protected, but crawling bugs can in principle get into the porch zone, yet the inner zone is fully sealed. There are 5 arches and this is steel, 19-22 mm in diameter. So this is a very strong structure that can withstand a lot of side pressure. You need it with such a large tent. You have 10 shock-corded pieces for the side walls plus 5 for the roof. Note that the roof poles are pre-bent and you will see this in the video below. There are also 3 inner poles for the towels and the wardrobe. This makes the tent quite different from the majority of the tunnel tents presented here in the site which usually have fiberglass poles. But see also this 4-season Crua Loj 6 with all steel poles. The shell is what they call Outtex 6000, 100% polyester Oxford/taffeta with all taped seams. The number 6000 indicates its incredible waterproof rating. The inner tents material is a breathable 100% polyester and mesh. The floor is sealed and this is a double-coated 100% polyethylene with 10000 mm hydrostatic head. So from the description above you have realized that there are 3 external doors, all double layer type with mesh and waterproof panels and PVC material. If you buy extra poles, you can create awnings with all of them. The huge front door on the porch can be completely rolled up (there are two zippers on the sides) and you have several meters wide entry from the front side, you will love to use it that way when the weather is great. But you can zip it down, and you will have 3 PVC windows on this front panel. One of these windows is on the “normal” door which you have here on this front panel with its separate zipper. But this front section is also with mesh, just to know so you have lots of the air circulation from here. There are 3 inner doors on the sleeping area, all with mesh in the upper sections, and there is the mentioned huge inner door between the porch zone and the living room. There are around 20 PVC windows and all are tinted so you have quite some privacy with this, but all of them are also with inner panels and equipped with zippers. So you can keep them open or closed at any position you want and regulate glare and privacy. Note that even in the sleeping rooms you have narrow windows to look around and see what kids are doing if they are outside. You will see differences in some variants of this tent, some of them are without PVC windows on the sleepig zone, so the number is not everywhere the same. In any case, this is a great design, nothing to object here. 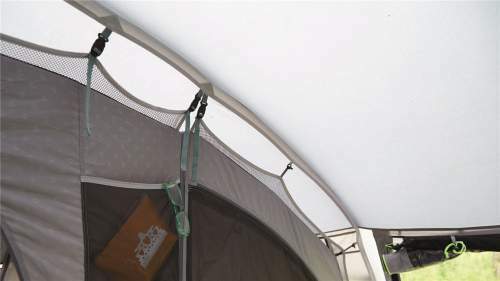 This tent is fully closed, there are no mesh sections without panel protection. So ventilation depends on vents and on mesh on the numerous doors both external and inner. Now, the vents are numerous, you have them many on all sides, you can see them above the windows, they are all with Velcro stiffeners so you can keep them open or closed. It seems that there are differences in the number of vents in different versions of this tent. In any case, you have them 8 – 10 all around the tent. The huge inner door is around 4 meters wide and it has two huge mesh sections in its upper half, but here you also have panels with zippers so the living room can be sealed completely. If you need extra ventilation, simply unzip those panels. Both side doors are also double-layer type, so if the weather is great you keep them with mesh only and have an extra good cross flow. This is yet another tent within the tent, and it is located in the living area. You have around 1.8 m² (19.4 ft²), it is with a zippered door, and inside you have a metal bar to hang your clothes. You can use this space also as a night toilet for kids, there are nice portable camping toilets and you can see some great models here. Hanging towels bars. Those are located in the porch area above the side windows, and you can hang your wet stuff here. If there is water dripping from the wet stuff, you just move the floor in these sections under the bars and the water will go on the ground. Lantern hanging points at several places both in the living room and in the sleeping rooms. Zippered cable entry points at several places and cable tidies to pass the cable along the arches. There are organizers pockets on the wall between the inner tent’s doors, plus storage pockets in the sleeping sections, some 20 or so pockets in total. OGR System that includes Velcro tabs (Outwell Guylines Retainers) which keep guylines packed nicely. 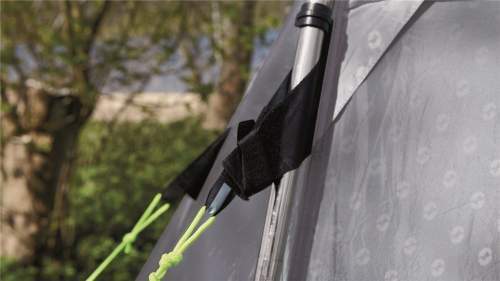 You have the OWS system in place (Outwell Wind Stabilizer) and this means a strong hook and loop (Velcro) fastening system for the flysheet and tent pole for a better stability in the case of winds, see the picture below. The 3 types of pegs, all color-coded. Fully enclosed area with solid windows. – Poles: 52 lb (23.6 kg). – Flysheet: 73.3 lb (33.25 kg). Dimensions: 319 x 189 in (810 x 480 cm). Inner area: 253 ft² (23.48 m²). 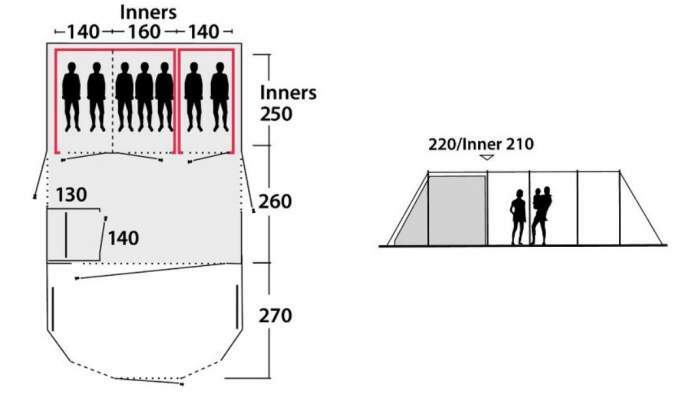 Inner area per person: 36 ft² (3.35 m²). Porch area: 118 ft² (11 m²). Total protected area: 371 ft² (34.48 m²). Total area per person: 53 ft² (4.9 m²). – The tent: 30.7 x 15.7 x 16.5 in (78 x 40 x 42 cm). – The poles: 30 x 9 in (76 x 23 cm). Height: 86.6 in (220 cm). I thought you might want to see this tent side by side with some other multi-room tents. The Vango Marna 600 XL is very similar in style, the Eurohike is a bit different but also with 5 rooms. Please follow the links to check the updated prices, the differences are big. Vermont tent offers far more of everything, but see its weight and the packed size. This Outwell Vermont XLP Premium 7 Person Tent is one of the most impressive tents presented here in the site. You have seen all its features, no need to repeat them here. This is a mixed tunnel-cabin type tent. I have included it in the list of extra large tents, extra tall tents, tents with 5 rooms, and also in the group of tents for cold weather. All these features come at a price of course but as I said above, it is worth it. You might want to compare it with this Outwell Clarkston 6A Tent from the same brand but with inflatable beams instead of poles. Thank you for reading. Do you have any experience with this tent? If so, please share it with use here, there is a comment box below. I wish you a pleasant day. I am not selling these tents myself. If you follow the links in the text this should redirect you to any of the Amazon stores. I know that this Outwell Vermont is available on Amazon-FR and Amazon-UK. So if you follow these links you will see the current prices. As for 3-room tents, please see in this category within the site, you will see 36 of them currently.